52 Mantels: A Modern Scrapbook...from Smart Phone Pictures! 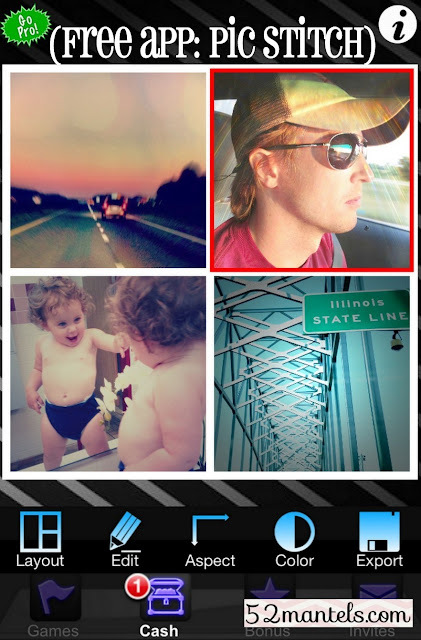 A Modern Scrapbook...from Smart Phone Pictures! I've been away, for what seems like, ages! Okay, it was just 7 days, but it was a very full 7 days of roadtrippin', family wedding festivities, sightseeing and exploring. We launched the trip for a cousin's wedding in Michigan and, being the roadtrip lovers that we are, decided to drive to our destination from Texas. On the way home we spent 3 days/nights in Nashville. In total, we found ourselves in 9 states in the 7 days. And, that, friends, is what roadtrippin' is all about! I did take my camera on our trip, but only used it once or twice. The rest of the trip was documented on my iPhone. You just can't beat the portability of a pocket size device. I instagrammed a lot of those pictures and some of you followed along on my journey...but, I captured WAY more fun moments than I shared. When I got home I was eager to make a scrapbook (of sorts) with those pictures as a way to remember our fun week. I think this 8x10 photograph pretty much sums it all up. This being a modern scrapbook, I took advantage of a variety of apps and programs on my iPhone and computer. The first thing I did was create 6 collages using a free iPhone app called Pic Stitch. I chose the layout that allowed for 4 equal-sized squares. I narrowed our trip down to 30 pictures and started creating collages and saving them. When I synced my phone, the 6 collages were on my computer and I was able to build my 8x10 collage using Picasa on my desktop (another free program!). If you haven't used the collage feature on picasa, you totally should. It's so easy! 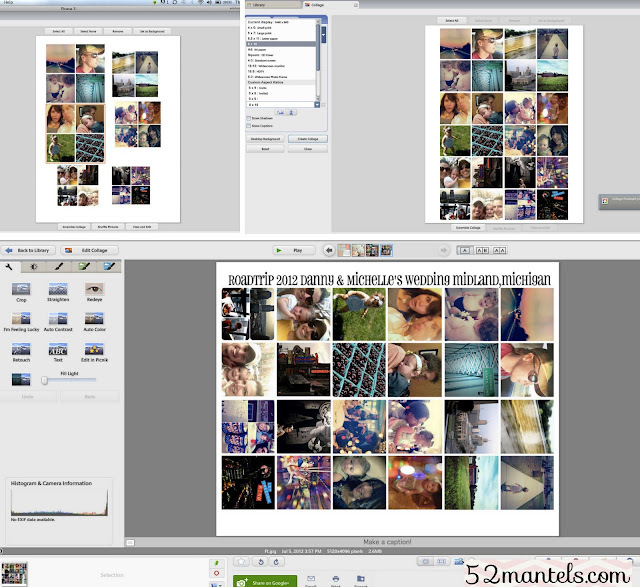 On my picasa program, I added the six collages and sized them equally- 2 across and 3 down. I made sure to do this on an 8x10 layout since I wanted to print it as an 8x10 photograph. When my collage was created, I flipped the image on it's side and added text and repeated that for the opposite side. I saved my image and then sent it over to Walgreens to be printed as an 8x10 ($2.99). An hour later, I picked it up, brought it home and clipped it to a message board in my bedroom. Easy, peasy. Do you have a ton of pictures on your phone?? I highly recommend putting this tutorial to use and getting yourself a hard-copy. This little collage makes me smile every time I walked past it. And, when the next event or vacation happens, I can easily place this photograph in a book for safe-keeping. 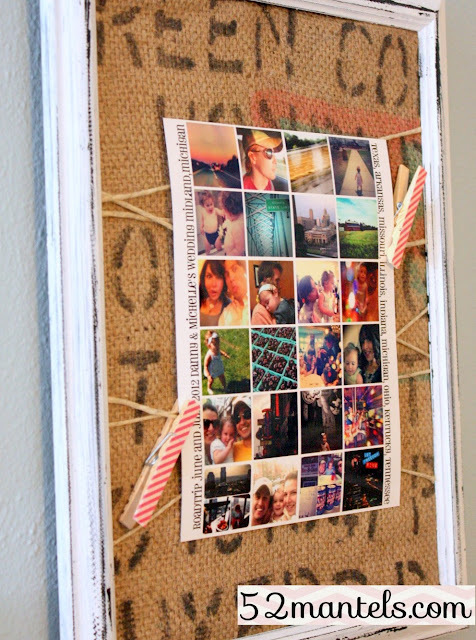 **update: the burlap and twine photo board tutorial can be found here! Christine, Thanks for the comment! In case anyone has the same questions, I'll answer you here. 1) Honestly, I've only synced my phone this one time, so I have no idea! All of the pictures on my phone just transferred over automatically when I synced it. 2) I'll work on trying to write a more detailed tutorial when I get some free time. It's really an easy process, so I'll see if I can figure out how to explain it better! So smart! I'm totally going to do something like this! Love this! I love free apps to and totally want to make that frame!! I will be serching for that app for my phone and ipad. Thanks for the tips! First of all, this looks really really cool. I need to get myself a smartphone one of these days. Also, where in Michigan did you go? I live here :) Did you go someplace beautiful? On the lakeshore? This is way cool! I have 400+ on my iPhone, so I totally need this! brilliant! I don't take too many pics on my phone but my kids do! We even had a party where I forget to take any pictures and later opened my phone to see a ton of them taken from 2' off the ground! 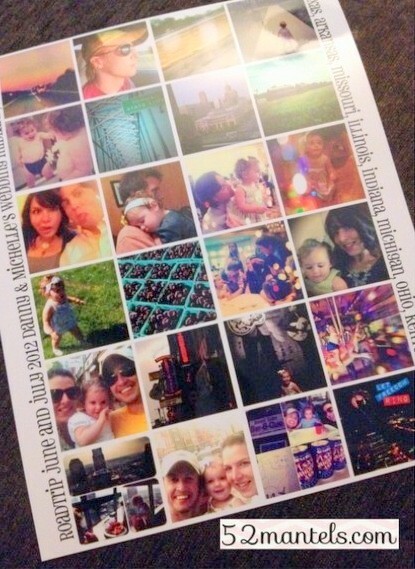 Super great idea to make a collage with Instagram photos. I have over 1,300 on my phone! I do use Picasa for collages but had not thought to create an Instagram set. Thanks for the inspiration! You must have KNOWN I was going to ask how to do that? Or what app you used on your phone? ...or did I ask that stuff already...UM...I think I did...Maybe...Heehee!! this is awesome! I'm totally going to do something like this! effective. A lot of times it's very difficult to get that "perfect balance" between user friendliness and appearance. I must say you've done a very good job with this. doing some social bookmarking for a few of my sites but wasn't sure if it would generate any positive results. Thanks. 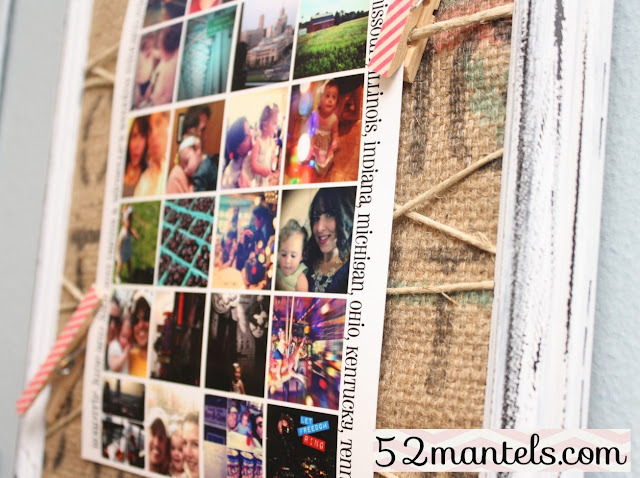 Browsing delicious.com I noticed your blog book-marked as: Blogger: 52 Mantels. bookmarking for a few of my sites but wasn't certain if it would yield any positive results. Thank you very much. Ván ép phủ phim, ván ép phủ keo là một trong những loại ván ép được sử dụng khá nhiều vào các công trình xây dựng.Mang bên mình một bề ngoài màu đỏ bắt mắt với người dùng nên chúng rất được ưa chuộng. Love it ! Collect Pictures is very beautiful. Visit my page : hộp quà tặng gỗ . Thank you !!! My page provide quà tặng gỗ khắc laser . If you can buy, visit it now. that great ! thanks to share that !